Great news to wrap up the year – the men’s shed movement is one of ten semi-finalists in the “community of the year” category. Armistice Day Commemoration Events. Many sheds contributed to community activities. Read more here. Conference 18 wraps up. What an event! More here. Masters thesis on Men’s Sheds and intergenerational mentoring in New Zealand by Jenni Moore available. The 2017 AGM is to be a Virtual AGM, hosted over the internet. Details to follow as planning is completed. The 2018 Conference and AGM will be held in Auckland. A team of sheds is in place to organise the event. Venues and dates are being considered. Queensland Reds “Be Great. Do Good” initiative supports men’s sheds in Canterbury. Cadeyrn Neville and Ben Matwijow will be wearing unique headgear for the match against the Crusaders on 6 May in support of MENZSHED New Zealand. The Blue Skies biennial conference is over. A report on the conference can be found here. The AGM was held at the same time as the conference and the results were as follows. Region 1, Upper NI, no nominations received by close date. The Executive have not been successful in filling the vacancy. Peter (Howick) advised that a candidate would be proposed soon. Region 2, Central NI, as a nomination was not received by close date, the Executive worked with member sheds to fill the vacancy. Rob Hall (Whakatane) appointed. Region 3, Lower NI, ­ Jeff Wakelin (Feilding) elected. Region 4, ­ Upper & Central SI, ­ Trevor Scott (Oxford) elected. Region 5, Lower SI, ­ Neil McArthur (Alexandra) elected. The following were re-elected unopposed. Chairman, ­ Ray Hall (New Brighton). Note ­ two year term. For information on the new Health and Safety at Work Act see website and video. Cambridge Community Menzshed is the 100th shed or new shed project to register with MENZSHED NZ. Article on the Henley Men’s Shed with additional comments from MENZSHED NZ has been published on the SuperSeniors website at the following link. Welcome to the Westland shed in Hokitika http://menzshed.org.nz/westland/ and a new shed project in Huntly http://menzshed.org.nz/huntly/ . Blackwoods Protector are the latest organisation to offer member sheds significant discounts across the product range of safety and equipment. Sheds are being contacted progressively as accounts are set up. New shed initiatives in Kaitaia and Morrinsville. Renwick added to the sheds in the Marlborough region. The name MENZSHED is now a registered trade mark of MENZSHED NZ Inc. Men’s sheds in New Zealand may use the name as part of their own shed name. Certficate here. to New Zealand for A$63 including postage. Barry thanks sincerely those who assisted in researching and writing it. He hopes you and others enjoy reading it and that is helps benefit the Men’s Shed Movement. Early indications of participation in the 2016 conference received from 21 sheds, comprising 54 sheddies and 12 partners. New shed initiatives in Timaru, Reefton, Westport and Greymouth. Men’s shed participants should contact the host organisation for the venue to secure a seat. “Here in Rotorua we are thrilled to tell you we have just been awarded the winner in the Trustpower Awards under Sports & Leisure section. We have worked very hard over the past 15 months since we opened our Shed here at 16 Te Ngae Road. Rotorua and seemingly there were many other groups in the running,so it was even better to know we had achieved this award. Recent additions to the sheds and new shed projects on the website include; Marton, Katikati, Ferrymead, Hei Hei, Upper Hutt, Heathcote and Timaru. At the AGM, Stuart Reesby of the Amberley Men’s Shed and Peter Lewis, Secretary of the Rotorua Community Menz Shed were elected as regional representatives. Volunteers are still wanted for regions 1 and 3. Other execs were re-elected. The 2015 AGM and Sheddies Ramble 11 – 12 April was attended by 42 members of 17 sheds. The weekend included enlightening visits to Magoos Street Rods and The Vintage Aviator. The Featherston, Greytown and Henley sheds each provided a different perspective on shed development and their interaction with the community. Participating in the formal opening of the Greytown shed was an additional highlight. FairDinkum Sheds are already involved with some sheds looking at new buildings and now have provided a donation to MENZSHED NZ to cover the cost of the website, GoToMeeting and other incidental costs. MENZSHED New Zealand National AGM and Shedders Ramble. Open to all sheds. Weekend 11th and 12th April 2015, Wairarapa. See the AGM 2015 page for more details. Note that accommodation is limited due to other events so plan your attendance now. MenzShed Kapiti is the winner in the Wellington Regional Community Awards for the Health and Wellbeing category. This is not only a great tribute for MenzShed Kapiti, but it is also great recognition for the contribution that Menz Sheds throughout NZ make to their community and to the wellbeing of the men in their community. A new shed initiative in Lincoln. An interest meeting will be held on Wednesday, 3rd December 2014 at 7.30pm. The AGM will be held in the Wairarapa on the weekend of 11th & 12th April. Planning is underway thanks to Greytown Menz Shed, MenzShed Featherston and Henley Mens Shed for a combined Shedders Ramble to Wairarapa Sheds, and the AGM. More details will follow in due course. A small group attended a meeting on 26 June and agreed to progress the establishment of a men’s shed in Bishopdale. The next meeting is on 3 July at 1:30pm at Sundbye House, 100 Farrington Ave, Bishopdale. If you are interested in establishing a shed in Bishopdale, you are welcome to attend. St. Johns have developed a reduced rate first aid course specifically for men’s sheds. The course is priced for a maximum of 20 participants. If your shed does not have the participants required, consider opening the course to other sheds in your area or other organisations. All welcome to look at the new shed, talk to “sheddies” and join if you want to. The newsletter has been pulled together from information provided by sheds and the executive of Menzshed NZ and it shows. As it is the first issue, the content has not been trimmed to only the newsworthy items. Bare with us, the next issue will be different. 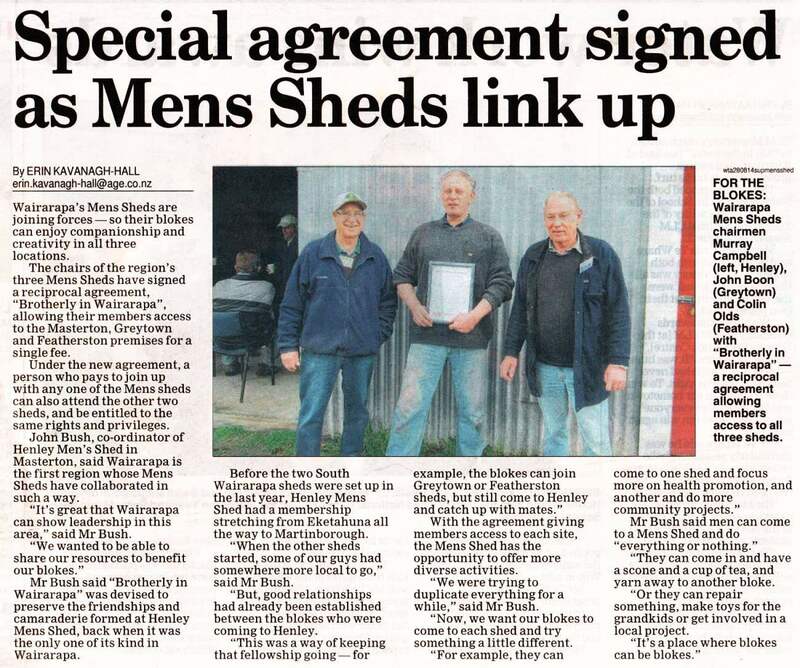 Featherston Menz Shed to open on Sunday 9 March at 1pm. Contact and location details are on the Featherston Menz Shed web page. Conference programme minor update and reminder to register now for 14 – 16 March 2014 Conference. The Waikanae conference programme has been fleshed out and an introduction from the organiser will give you a glimpse of what you can expect of the conference. Register now for the conference, 14 – 16 March 2014. New Brighton Menz Shed in Christchurch opened by Lianne Dalziel MP. Certificate of incorporation issued. The certificate and draft constitution can be found in the Library under Foundation documents. Hear John Shrapnell, secretary of the Wellington City Menzshed on Radio New Zealand National.